As others have pointed out, value investing is difficult to stick with (for an example, see Jason Zweig’s WSJ article). The charts below give a dramatic view into why this is true. In this analysis, the value strategy is simply to buy companies that are most inexpensively priced in relation to their prior year’s EBIT (earnings before interest and tax). The top chart plots the simulated performance of this simple approach to value investing in context of the S&P 500’s total return. The bottom chart shows how much and for how long the value strategy fell behind the S&P 500 at each point in time. 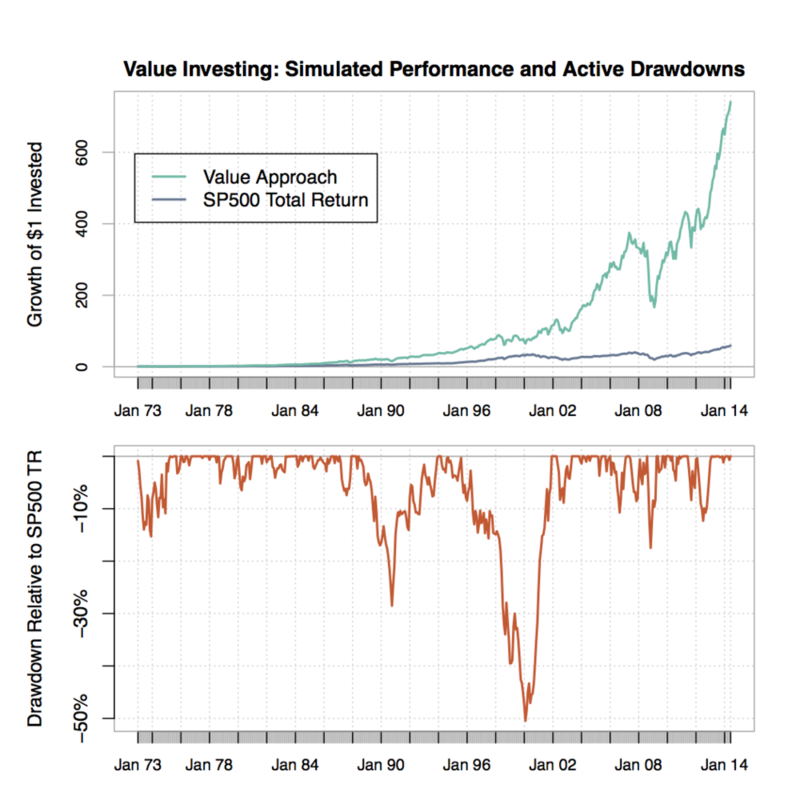 Across this particular simulation, over the period January 1973 to June of 2014, the value approach achieved a compound annualized return of 17.2% while the SP500’s total return (price change plus dividends) did 10.3%. Sounds amazing! Right? However, as the bottom chart shows, an investor using this value strategy would have had to endure 14-years (1988 through 2001) where he would not have received much feedback that he was on the right path. Soon after recovering from falling behind the market by 30% from 1988-1991, he would have lagged by nearly 50% across a grueling 6 years. How many investors would have had the conviction and patience to stay the course? 1) Even with a sound approach to equity investing, you should expect multi-year periods where crazy things happen. 2) To succeed over the long-term you should expect, and have enough conviction to withstand, these kinds of periods. 3) The rewards can be great for investors who have this kind of conviction. These results suggest that over the past 40 years, buying shares in inexpensive companies presented an investor with an opportunity to generate more than 10X the wealth than he could have realized from investing in the S&P 500. In the simulation, Standard & Poor’s COMPUSTAT database was used as a source for all information about companies and securities for the entire simulated time period. The S&P 500 return is the total return of the S&P 500, which refers to the Standard & Poor's 500 Index with dividends reinvested. Simulated returns also include the reinvestment of all income. In the simulation, NYSE, AMEX, and NASDAQ companies were ranked according Earning Yield. Earnings Yield is defined as EBIT divided by Total Enterprise Value. Non-US-based companies, companies in the financials sector, and companies with a market capitalization that, when adjusted by the S&P500 Index Price to January 2010, is less than 1 billion dollars were excluded from the ranking. The simulation results reflect assets-under-management (AUM) at the start of each month that, when adjusted by the S&P500 Index Price to January 2010, is equal to $100M. Portfolios were constructed by investing equal amounts of capital in the top decile of companies represented by Earnings Yield and then rebalancing monthly to equally weight the evolving constituents of the top decile. The amount of shares of a security bought or sold in a month was limited to no more than 10% of the monthly volume for a security. During the period 1983 to present, the purchase and sale price of a security was based on volume weighted daily closing price of the security during the first ten trading days of each month. Prior to 1983, when daily pricing is not available for all securities, the purchase and sale price of a security was based on the monthly closing price of the security.